After missing out on a potential season-turning opportunity last weekend at Texas, the high-banks of Talladega offered Denny Hamlin and the #11 FedEx Racing team another chance to put early-season frustration behind them and record a win at one of the Sprint Cup’s storied tracks. Unfortunately, after running competitively all afternoon, finding good speed and sound strategy in the two-car draft and setting himself up for a late-race charge, Hamlin lost his spot in line before crossing the line a disappointing 23rd on the day. Jimmie Johnson took the honors on the day, barely edging out Clint Bowyer and his Hendrick Motor Sports teammate Jeff Gordon at the stripe. Dale Earnhardt, Jr. finished fourth while Kevin Harvick rounded out the top five. Hamlin’s Joe Gibbs Racing teammates Joey Logano and Kyle Busch finished tenth and 35th. The finish see’s Hamlin move to 17st in the Sprint Cup standings heading into the off weekend. The #11 FedEx Racing team will next be on track when the series heads to Hamlin’s hometown track of Richmond International Raceway in two weeks. Hamlin started the day from 29th spot, seeking out favorite drafting partner Newman early on and working the #11 FedEx Office Camry toward the front. The two were in near constant communication as the laps ticked off, and the pair drove into the top ten by the time the field turned ten full circuits. When the first caution flew on lap 29, Hamlin pitted for four tires, fuel and both wedge and shock adjustments. The team took additional time to make the shock adjustment in attempt to help Hamlin’s handling when being pushed and he lined up 15th for the restart on lap 31. By the time the race reached the 50-lap mark, there was a near-constant level of communication between the teams and drivers as they work to find partners. With the two-car pairings proving to be the only successful way to maintain speed, emphasis was put on finding and keeping the partners that worked best together. Hamlin pitted the FedEx Office Toyota for right side tires and fuel on lap 69 and the team worked quickly to ensure he would return to the track with teammate Logano. The two joined forces again and held down positions just inside the top-20. Shortly after the halfway point the action picked up and several cars were collected in a large wreck in turn three. Hamlin missed the accident and crew chief Mike Ford called him to pit road for four tires and a full tank of fuel. Still paired with Logano, the two moved easily inside of the draft but never consciously tested their capabilities by attempting to get to the front. The two stayed locked together until a lap-127 caution for debris brought Hamlin to pit road for four tires and fuel. He restarted 16th on lap 131. A multiple car incident on lap 139 collected several cars and, though he was almost able to avoid the spinning cars completely, Hamlin suffered some damage to the front end of the #11. He turned onto pit road immediately where the team found a hole in right side of the front bumper. After patching the hole and assessing additional damage to the front end, the FedEx Toyota was filled with fuel and Hamlin was sent out to rejoin the field. He made one last stop when the caution flag flew on lap 163 with Ford calling for two tires and fuel only before restarting 16th with only 21 laps to go. 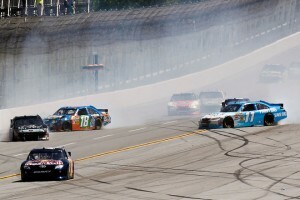 It was at this point that Hamlin’s primary plan came unraveled. Ryan Newman, who had been Hamlin’s best drafting partner on the day, lost a tire and spun down to the infield wall. After the caution Hamlin lined up with Logano and the pair laid out their plan for the final 12 laps of the race. While quick together, and able to work into the top-ten with less than ten laps to go, Dave Blaney’s spin with three laps to go forced Hamlin to check up and, in the process, lose the bumper and draft of Logano. As the top three pairs stormed toward the finish line, Hamlin had little recourse but to run out the race in 23rd.